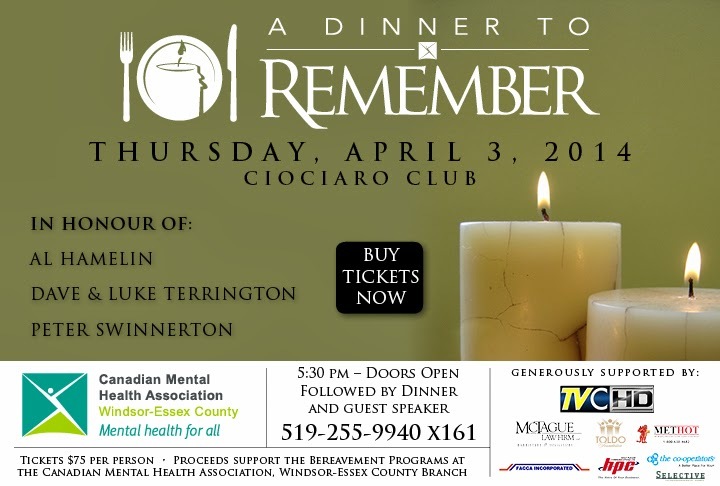 Canadian Mental Health Association is hosting its “Dinner to Remember” on April 3rd at 5:30pm at the Ciociaro Club of Windsor. A promotional flyer is attached with further information. Help Break a Guinness World Record! Everyone is Welcome!! Please Help in the Guinness World Record Attempt with the Windsor and Essex County Autism Community Sunday March 30th, at 4:00pm - 6:00pm Mic Mac Park Prince Rd Guinness needs everyone to wear Blue, Autism Awareness Blue is about the colour of this text!! The Windsor and Essex County Autism Community would like to invite you to participate in a Guinness World Record Breaking Attempt. We will attempt to gather as many people as we can in the parking lot at Mic Mac Park on Sunday March 30 at 4:00pm. We will stand in the shape of a "human puzzle piece" to raise autism awareness. The current record is held by a group of 250 people, so we need to have at LEAST that many, although we are shooting for many more. Please invite your family, friends, coworkers, dog walkers, bank tellers, and anyone else you can think of, and share the heck out of this event! I apologize for the last minute post. 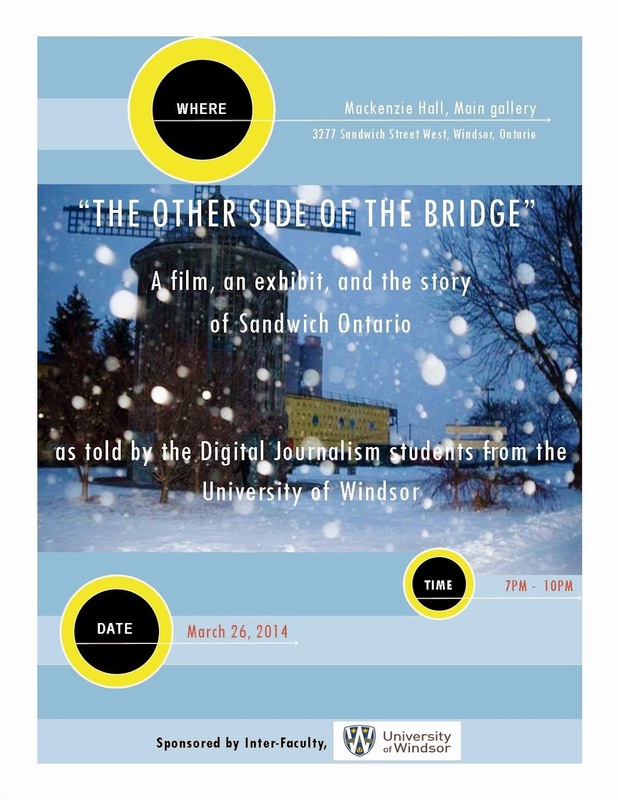 Students from the University of Windsor are showcasing a documentary on Sandwich Towne tonight at Mackenzie Hall. I will be at a committee meeting and may not be able to attend, but if you have time, go check it out. See the flyer below. To all Volunteers, Residents and Stakeholders: Thank You! I just want to extend my thanks to all of the volunteers, residents and stakeholders who have helped and continue to help with our grassroots initiatives. It can't be said often enough: our work cannot be possible without you. Please continue sharing information relevant to the west-end community and to the residents who live here. The more dialogue, the better. Lastly, thank you for being leaders in your neighbourhood. We live in a great community and we have a lot to be proud of. Happy St. Paddy's Day! Sandwich Street will be closed from the Dominion House to Rock Bottom's, today and tomorrow, for the festivities. If you choose to celebrate, please drink responsibly. Please see an email I received from the West End Crawlers. Sunday: 11am-11pm and Monday 3:30pm-11pm." Amy took me for a tour of the facility and showed me all of the stock they have available for kids of all ages. They provide free clothing for children and youth up to 18 years old. Please spread the word about Cuddles Clothing for Kids and help support this much needed community service. I received the following email below from the manager at the Sandwich IDA Lab on Sandwich Street. All are welcome to attend. I will be having a Grand Opening Celebration for the Sandwich Lab on March 24, 2014 @11:00. I would love it, if you could come. We will be doing the Ribbon Cutting ceremony @ 11:00am. We are very excited to announce that United Way/Centraide Windsor-Essex County is once again engaging the public in helping to choose our investment priorities for the next five years. To date we have spoken to almost 750 people about their needs and dreams for our community.Based on that feedback, we have created a survey.This survey asks the community to rank a series of goal statements.These rankings, along with our own research will be used to determine where United Way will focus its resources from 2015 to 2020. Back in 2009, you may have assisted us with promoting the survey to your networks and/or staff.As a result, a resounding 3,000 people gave us feedback.We are asking for your help in distributing the link to www.TOGETHERWEDREAM.CA.The online survey found on this website, will be officially active February 27-March 13, 2014.